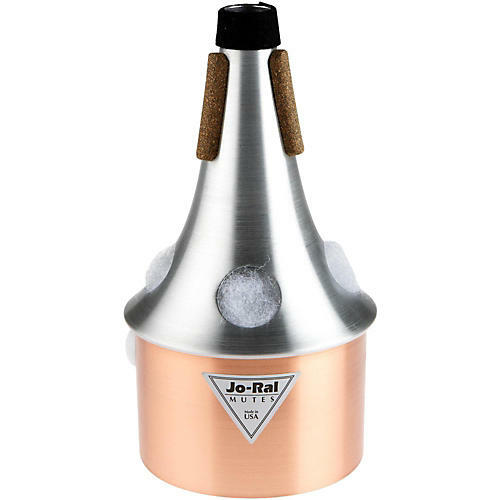 The Jo-Ral 4C Trumpet Bucket Mute is crafted from aluminum and copper. The acoustic design of Jo-Ral Trumpet mutes creates an exciting tonal quality that results in near-perfect intonation. They are made of spun aluminum, and have been tested to perform evenly in all registers. Alternative materials used on the bottom of the mute create varying sound characteristics for special effect, giving musicians the freedom of artistic expression. This copper-bottom mute provides a darker, more mellow effect. The trumpet bucket mute provides a unique, haunting sound that is both deep and slightly hollow. This is a specialized mute for a distinctive sound.